As I observed yesterday, the U.S. Court of Appeals for the Third Circuit upheld New Jersey's ban of conversion “therapy” on minors. 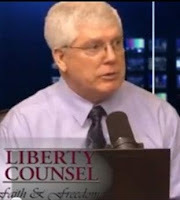 Mat Staver and three other lawyers from Liberty Counsel represent a New Jersey couple who said their constitutional rights were being violated because the law prevents them from seeking treatment for their teenage son. The lives and mental health of minors in New Jersey are at stake, and it is critical that the Supreme Court step in to protect the fundamental rights of counselors, minor clients, and their parents. Clients have the fundamental right to set the goals and objectives of their counseling, and the State has no place interjecting its politically motivated assault on the religious beliefs of minors and their parents in New Jersey. Staver is right about one thing. “The lives and mental health of minors in New Jersey are at stake.” That is just the reason that New Jersey has made the correct decision, signed into law by a Republic governor, to protect kids from pseudo-scientific practices that are ineffective and potentially harmful. One cannot, or should not, dismiss a mountain of published and peer reviewed research because it conflicts with a book written thousands of years ago. Doing so is just … well, plain stupid when it comes to the welfare of your own children. The chances that the Supreme Court will hear this case are probably nil.